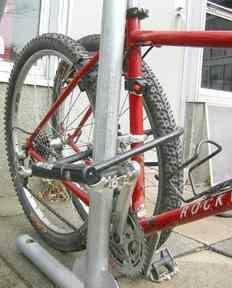 An example of a proper lock-up – the “U” lock is around the frame and rear tire, secured to a bolted-down bike rack. In the City of La Crosse, the Municipal Code of Ordinances 9.15(D) requires bikes ridden within the City to have proper registration. This FREE service can be completed at the Police Department at 400 La Crosse Street, between the hours of 8:30AM and 5:00PM, Monday – Friday. You will need the make, model, and serial number of the bike. A copy of the Bicycle Registration Form can be found online at the Police Department website. If your bike is stolen, fill out a police report. You can do this at the Police Department, or if you have no suspects, you can fill out an online theft report. You can check for your bicycle at the Police Impound Building or “Bike Barn” at 1925 Marco Drive on Isle La Plume. The bike barn is open the first Wednesday of each month from 5:00PM – 6:00PM. The remaining 2014 dates include August 6th, September 3rd, and October 1st. To claim your bike, you must have a copy of your submitted police report.